Performed by Emil Rovner, violoncello and bass voice. Performed by Emil Rovner, violoncello, bass voice, Chamber Orchestra "The Soloists of Nizhniy Novgorod"
In Memory of Goce Kolarovski. Music for strings. Performed by Chamber Orchestra "The Soloists of Nizhniy Novgorod"
Quasi balletto per orchestra. 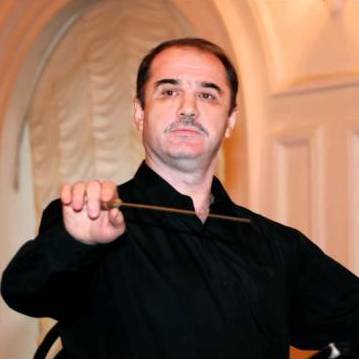 Conductor - composer Evgeny Shcherbakov. "Thou, O Word..." for Mixed Chorus a Cappella. World Premiere. Performed by Vancouver Chamber Choir, Jon Washburn, conductor. 15.10.2010 Ryerson United Church, Vancouver, Canada. Capriccio Hebraico for Emil Rovner (cello) and his voice. – Quasi balletto per orchestra. Conductor - composer Evgeny Shcherbakov. "Mood" for a violin and a string orchestra. Performed by chamber orchestra "The soloists of Nizhny Novgorod"
"In the Vienna Dreams Brigtness" Concertino for a string orchestra. "Five Spiritual Chants". For soprano voice, violin, cello and piano. Based on Russian orthodox texts. "Flamenco's dream" for clarinet(s), violoncello and pianoforte. "Nocturne" for flute(s) and piano. Performed by Duet: C.Hustedt and S.Abels. "Don't leave me when there are tears in my eyes..."